It is nearing the end of October and already the kids are exhibiting signs of coughs and colds. To add to it, I have been feeling a little under the weather myself. We have stocked up on our vitamins and have a fresh supply of natural cough and cold remedies but honestly, what worries me most is that nasty f-word: fever. Apparently, I'm not alone. 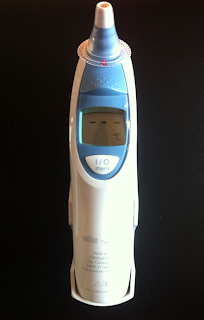 According to a recent survey of approximately 750 Canadians conducted by the makers of Honeywell Air Purifiers and Vicks Humidifiers & Thermometers, 64 per cent indicated that fever scares them. It comes as no surprise to me because I have seen my fair share of fevers in my own two children from the newborn stages to the tween-age years. And it's never pretty. While the unknown cause of a child's fever can be worrisome, so can the uncertainty of an accurate temperature reading cause anxiety among parents. 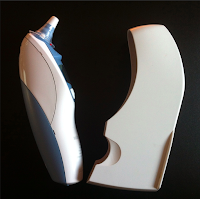 Over the past decade, our family has tried a handful of different thermometers, most of them designed to take axillary temperatures (under the arm). 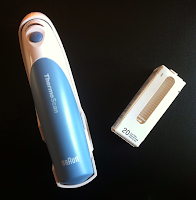 The one thermometer we have had the most luck with, however, is the Braun ThermoScan Ear Thermometer. A few years ago, I noticed it was on sale at Shoppers Drugmart and I decided to use my Optimum points so I paid next to nothing for it. We have been using it ever since. The thermometer features a patented pre-warmed tip that minimizes the cooling effect of inserting a cool probe tip and helps ensure accuracy time after time. It also features a Guidance System that checks the position of the thermometer in the ear and confirms the accuracy of the measurement. Since you need to use a new disposable lens filter each time, the ThermoScan is designed with a lens filter detector and ejector. It requires 2 AA batteries and includes 21 lens filters as well as a protective case with lens filter storage. 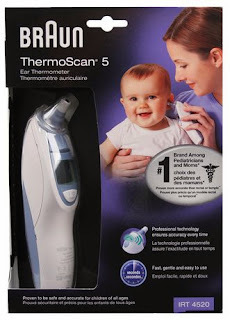 This thermometer generally retails for $79.99 but you can get a bonus of 40 filters if you buy the Braun Thermoscan at Toys 'R' Us. To help you through cold and flu season, one lucky reader will win a Braun ThermoScan. This is just the first in a series of mom and dad must-have reviews so be sure to come back soon for additional giveaways such as the Honeywell AirGenius Air Purifier valued at $230! I don't have any parenting tips as I am expecting my first in a couple of weeks, so this would be awesome to win for our little girl!! Congratulations, Tanis! That is such exciting news. Wishing you the best! Keep your child hydrated as best you can during a fever as a fever can be dehydrating. Fevers are good, it means the body is responding and fighting the infection. whenever possible do not medicate for a low grade fever, wait until it is a high fever. I wonder if these work like the laser thermometers I've seen. Lasers make everything better! With fevers I always provide Tylenol, and lots of fluids, like watered down juice. My best tip for dealing with fevers is the pediasure popsicles, tylenol and lots of snuggles in mummy's bed. We deal with a LOT of fevers in our youngest and one of the best tips for fever reduction is ice chips. Great for sucking on and for slowly reducing inside temp. popsicles and a Tylenol and Advil rotation. Lots to drink, a cool cloth and quiet movie. Lots of fluids and cuddles! cool baths with a few favorite toys seem to work best for my smallest man when he's fevered. I still like to do the cool wet wash cloth on the face -- and change it often. My best tip is to keep sick kids hydrated and keep a close eye on the fever. Popscicles and cold cloth on forehead! cool compresses and lots of fluids. I use a washcloth with water and just run it over them, especially let it soothe their forehead. In a pinch, a baby wipe will work as well. Lots of hugs and cuddles, cool cloths to the forehead and occasionally alternating Tylenol and Advil if probs getting the temp down. I don't have a ton of tips since i am not a parent, but my Mom would always put a cold wash cloth on my head when I had a fever! Lots of snuggles and patience. Lots of cool liquids and Popsicles! If you suspect anything, give tylenol. my son had a febrile seizure and it's my worst experience to date. I use Advil over tylenol because it suppose to last longer. I also use popsicles if I need to bring the fever down. Lots and lots of fluids! Lots of fluids, ibuprofen if needed, cuddles and kisses. Keep them hydrated and some advil then snuggle on the couch with some good movies! Give them lots of fluids!! Lots of water and juice, cuddles, and make sure they aren't overbundled. I only give Ibuprofin if fever is high. A trick my Mom used to do with me was apply a cold face cloth to my forehead. Other than that - it's important to stay on top of hydration, rest, rotate Advil and Tylenol (ever 4 to 6 hours) and snuggle. Try not to overdress the feverish little one either. Someone once suggested to me to put 2 drops of hydrogen peroxide in each of my ears when I have a fever so I tried it out and I have no idea why, but it has worked on more than one occasion! I usually change my children into a light nightshirt and then give them lots of fluids and Popsicles to help make them feel better. Tylenol, lots of fluids and snuggles! Tylenol if it gets too high, chicken soup and sweetened herbal tea. I find Advil works way better than Tylenol, at least on my little guy. We write the day off and snuggle on the couch with a movie. I used to put cold water in the sink or a bowl with ice cubes. Place a cloth in it to get it nice and cold... then place it the forehead and around the back of the neck. Popsicles! Keeps them hydrated when they don't want anything to drink. I give my kids lots of fluids,tylenol and a damp washcloth. Also lots of snuggles help the kids feel better! Keep them well hydrated! Jello popsicles (sugar free!) work amazing when they do not want to eat or drink water. My son recently went through a couple days of very high fevers, you can instantly bring down a fever with a dose of Childrens tylenol followed by a dose of Childrens Advil, then give them a cool bath! The Tylenol and Advil trick works like a charm and is actually something recommended by doctors! We let them stay home from school and lots of bed rest and fluids including Childrens Tylenol. Keeping them warm, giving them lots of nutritious fluids and reading lots of fun stories. I always put a cool washcloth on their forehead to bring the heat down. I tend to medicate if they seem like the fever is bugging them, otherwise just lots of fluids and snuggles. Children always need lots of rest and cuddles, don't forget to keep up the fluid. Lots of fluids and snuggles seem to help as well as some special treats like frozen juice popsicles help bring down the fever. popsicles, and let them play in a lukewarm bath as long as they want. Take them to the doctor and keep them out of school so they are not spreading germs. I try to make it fun for my little one to take medication when needed. It's hard to avoid getting sick. Lots of juice and quality time with mom reading books. lots of fluids, tylenol if needed and of course cuddles from mom. Lots of fluids, pedialyte is good if hydration is an issue. Keep an eye on fever, doesn't get too high!